I nervously stepped into the water after changing out of my trail runners and into my chacos. 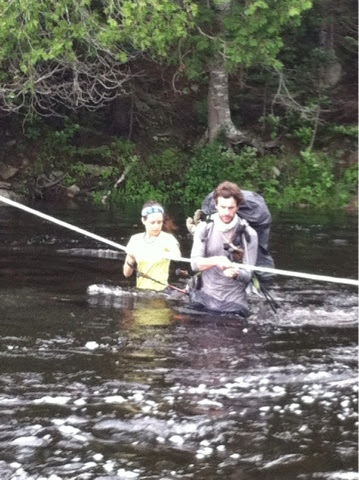 Stacey agreed to carry my pack accross since the water was over my waist. We hiked 3 miles beside the roaring river and I was praying the entire time that we wouldn't have to ford it. "Surely, we don't have to cross this" I kept thinking, "it looks like the Ocoee!" Thankfully we had to cross at a wide spot with no rapids; yet, the water was still moving fast and the current was strong. I was relieved there was a rope tied from one end to the other that I could hold on to. As I reached for the rope, I imagined myself slipping on the slimy rocks and being carried downstream- ending my thru-hike. I heard my Dad from the other end yell out "hold on to the rope and you'll be fine!" I quickly shook my nerves off and started singing a song called "no fear" from a Disney movie me and Lexi used to watch. The water was so cold that it took your breath away. I moved as fast as I could while fighting against the swift current. By the time I was in the middle of the river the water was up to my chest. After I made it to the other end I felt a moment of victory. I was one more river crossing stronger, braver and more confident. I also took a minute to appreciate my loving husband who had to cross 2 extra times to bring my pack over. As we waited for Tucker and Luke to cross, Dad and I looked up the trail and noticed that it was gone. The trail was flooded from the previous 2 days of rain and was now a creek. He just laughed and with the most positive upbeat attitude remarked, "now, this is adventure." We hiked the next 13 miles in ankle deep water. We did our best not to roll our ankles on the rocks below, but it was inevitable. The whole day was spent trying to keep each other laughing at the situation. Tucker made jokes about how he liked to hike in wet socks and shoes because it felt like squishy memory foam. Luke sarcastically talked about how he needed a boat. These are the perks of hiking in a group- uplifting encouragement. We honored the 17.9 mile day of adventure with a big campfire. The Appalachian Trail is full of adventure, but can easily be under appreciated and taken for granted. I'm glad we have each other to remind ourselves of this once in a lifetime experiences. Life is what you make it. So next time you find yourself in a scary, uncomfortable or unenjoyable situation, live it and learn from it. We are returning to the trail today with rested bodies and full bellies thanks to the Stratton Diner. Our next few days look challenging but we are more than ready to get back to the woods! That's my boy. Good men always take care of their wives no matter what it takes. Opal+Wonder is now available locally!